Introducing PV Logic, a great addition to your solar array which will keep you updated on power production and earnings at anytime and critically, will alert both you and SolarPVE if the system stops working. System faults are very rare but can be caused by a simple trip switch or fuse failure – easy to rectify but what would happen if this occurred and you were unaware the system had failed? PV Logic takes its information from a state-of-the-art “SmartMeter”, which can be specified instead of the standard KwH meter and fitted during the installation of your solar system. Data is transmitted automatically by GPRS from the installed SmartMeter to our servers, so there is no need for telephone lines or broadband to be connected to the meter. The cost over and above the standard solar system cost is £199.00, including VAT, plus an annual subscription charge of £39.99 (inc. VAT), chargeable at the start of each new 12 month period. 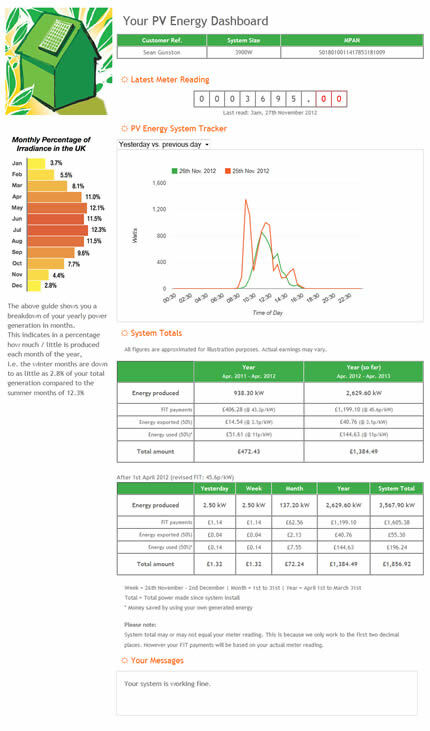 Subscription is free for the first year and ongoing subscription to the data logging service is not compulsory – the SmartMeter can still be read in the same way as a conventional KwH meter. This system can be retro fitted to your solar PV installation so even if you don't have one of our PV systems we are still able to provide you with this service. please contact us for more information.